The Ministry of Finance announced on September 11, 2011 that a special tax or ‘xaratsi’ would be assessed to all properties in Greece, raising an estimated €2-3 billion to qualify for the next bailout tranche and avert default. Original rates of €0.50 to €10.00 were doubled three days later to €0.50 to €20.00 under the assumption that many people will not pay, though the government was advised to keep rates low to increase the likelihood of payment. The emergency tax — called Εκτακτο Ειδικό Τέλος Ηλεκτροδοτούµενων ∆οµηµένων Επιφανειών (ΕΕΤΗ∆Ε)/Entakto Eidikio Telos Ilektrodotoumenon Domimenon Epifaneion (EETIDE) — affects approximately 5.1 million properties and lasts two years will be applied though 2013 for the foreseeable future, with rates climbing progressively higher as property values are adjusted. The first adjustment occurred in June 2012. Parliament passed the bill on September 27, law 4021/2011 was published October 19, and amendments were made October 20, December 1, December 16 in 2011; February 3, March 2, May 25 and July 18 in 2012. A bill to merge EETIDE and regular property tax (FAP) into a single tax, formerly Ενιαίος Φόρος Ακινήτων/Eniaios Foros Akiniton (ENFA) and now called Ενιαίος Φόρος Ιδιοκτησίας Ακινήτων/Enaios Foros Idiokthsias Akiniton (ΕNΦΙΑ or ENFIA), with revised thresholds to simplify billing and collection by tax authorities, reached agreement in February 2013, was voted into law on December 21 and took effect January 1, 2014. A motion to adjust objective property values to reflect market reality and not inflated values of 10 years ago, which would have lowered taxation rates for 2013, was discussed and failed. For many owners, this will cancel any 15 percent discount on EETIDE from July 2013. *Article last updated on September 1, 2014. Comments reflect whatever laws were in effect at the time, and there are two updates pending. How the property tax is invoiced on a real-life electricity bill. *It has been plagiarized by lawyers, accountants, expat INFO guides and property management companies. Be careful who you trust. 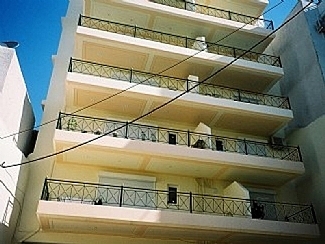 Nearly all persons who own commercial or residential property in Greece. Country of citizenship and whether or not they live in Greece are irrelevant. It is not a ‘wealth tax,’ as Forbes and Telegraph UK called it. The tax applies to all property owners, regardless of property value and income tax filing status. Thousands of unemployed and low-income families will be required to pay this tax at the same rates required of wealthy elite. Property owners will pay the emergency tax, unless they or their properties are exempt. — Empty, abandoned, disused commercial property with no evident electricity supply. Empty residential property does not qualify. Electricity bills for communal areas of apartment buildings are excluded, so koinochrista or common expenses are unaffected. Hotel and camping communal areas are said to reduce the tax by 35 percent, rented rooms by 17 percent, and industrial buildings will be charged 30 percent and 60 percent less on surface areas above 1000 sq. meters and 2000 sq. meters, respectively. — Tenants renting or leasing a home: Tax will be assessed through the electricity bill, but anyone renting an apartment or house can pay the bill as scheduled and then deduct the amount of rent normally paid or work out an alternative plan with the owner/landlord. It does not matter whose name is on the electric bill. — Persons jobless for at least six (6) of the last 12 months preceding the date of the electricity/tax bill, who are registered with any unemployment fund and have a total income of less than 12,000 euros on the 2011 tax filing (+ 4,000 euros for each dependent). Must have been unemployed on September 17 to qualify. Person with at least 67 percent disability from cerebral palsy, autism, Down syndrome or another mental disability. The blind were moved to the fully exempt list in amendments passed October 20, 2011. *Kathimerini English said three children; government circular and all other sources said four children. c) located in areas where property values (zone rates) are less than €3,000 per sq. meter. Surface area in excess of 200 sq. meters will be taxed at a higher rate. The first installment of the emergency tax for properties with an electricity connection was calculated and billed via power companies under the assumption that there were no exemptions and no persons qualifying for the lower rate. Therefore, everyone is expected to pay, then apply for a refund. To apply for a refund and record an exemption or reduced tax rate on future invoices, the owner must file an application at the Greek tax office/eforia (DOY), a copy of the electricity bill (if relevant), proof of payment, certification/pistopoiitiko of blindness/disability (if applicable), a property tax statement (ΦΑΠ/FAP) for 2011 (companies/entities) or an ekkatharistiko ETA for 2008 or a contract of sale (individuals) if property was acquired after January 1, 2008. Taxpayers who did not file taxes electronically with GSIS may be asked for additional documents. The tax office/eforia (DOY) will crosscheck the application and documents with tax statements filed with GSIS and other authorities to verify that the owner and property qualifies, then accept or reject the application. If accepted, the tax will be adjusted on future invoices and a refund issued. DEH/PPC customers who may be eligible for the lowest rate of taxation or an exemption were given three days notice to send ETA, AFM (tax number) and DEH account numbers via sms to ‘54160’ by October 2, 2011. Ignoring that the blind and financially challenged cannot send sms, Eleftherotypia reported the Ministry of Finance disseminated a number belonging to TV station and another subscriber. It still lists this number in official documentation, and it is unclear whether the Greek government has since taken possession of 54160 or is ignorant and did not edit the circular. Total area is defined as all declared areas with electricity supplied, including parking garages, storage rooms or balconies. Basically, the Τέλους Ακίνητης Περιουσίας (ΤΑΠ)/Telous Akinitis Periousias (TAP) deemed taxable according to Article 24 of Law 2130/1993. The size of your property in square meters (m²/µ²) or τετράγωνο μέτρα (τμ) is listed on electric bills of all power companies. For DEH/PPC customers, on the same page as the perforated payment coupon, it is the number under ‘τμ’ in the first box. Properties between 0-25 years old will be assessed an extra surcharge of 5-25 percent, inversely proportional to age (skip this section if your property is older than 25 years). The newer the property, the higher the percentage; the older the property, the lower the percentage. In tables published by the Ministry of Finance and Greek news, the percentage is expressed as a coefficient for multiplication purposes. As 64 percent of properties in Greece are more than 25 years old and only 2 percent built in the last five years, the surcharge is said to target those who can afford to pay. Properties in Greece are assigned a zone rate or Τιμή ζώνης (timi zonis) according to location, with minimum and maximum values expressed in euros and square meters, i.e., €1,800 per sq. meter. Eleftherotypia compiled tables that show a range for areas of Athens, Macedonia/Thrace and other areas of Greece on the islands and mainland (in Greek). The actual zone rate for a property is determined by street and exact location, which can be verified at the Greek tax office nearest the property. The zone rate of your property will determine how many euros you will be charged per square meter. To find the zone rate for your property, look for ΤΙΜΗ ΖΩΝΗΣ on the electric bill. For DEH/PPC customers, on the same page as the perforated payment coupon, the first box lists it under ΤΕΛΟΣ ΑΚΙΝΗΤΗΣ ΠΕΡΙΟΥΣΙΑΣ (ΤΑΠ). 80 × 1.05 × €6.00 = €504 for the year 2011. Property values (times zonis) for 2012 and beyond will be adjusted higher, which will change the calculation and increase the amount of tax owed. So property owners can expect to pay progressively more each year, and this article will be updated to assist you. If your property is in an area where no zone rates have been set, the property tax is calculated: Number of square meters × 3. For example: If your property on Chios has no zone rate and it’s 100 sq. meters, then the property tax calculation would be 100 × 3 = 300 euros. Property owners and their tenants (if applicable) will immediately recognize if the electricity bill contains property tax because the abbreviation Ε.Ε.Τ.Η.Δ.Ε. will show in several places (pink circles in photo). The main calculation can be found in a box on the right hand side marked Ε.Ε.Τ.Η.Δ.Ε. + year and appears in the same order I gave in the explanation and example above: Size of property + Age of property (if applicable) + Location of property (based on ΤΙΜΗ ΖΩΝΗΣ/zone rate). Underneath, it specifies the installment or ΔΟΣΗ. 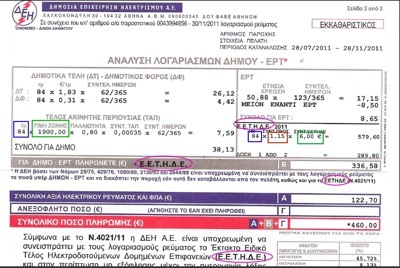 *Photo of electric bill with property tax has been highlighted with corresponding colors, so readers can locate each element without knowledge of Greek. Some info has been removed for reasons of privacy. When can I expect a bill? Most property owners will be invoiced for the tax via electricity bills. 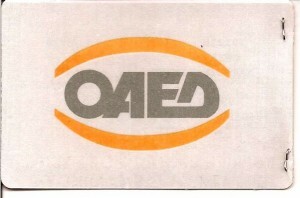 Two installments in 2011: First ΔΟΣΗ began billing October 2011 and the second before February 2012 to show revenue on the books for 2011. Five four installments in 2012: Billing from end of July 2012 to March/April 2013 April 2012 to January 2013 May to December. DEH/PPC, with a capacity to print 190,000 statements a day, said that the entire first cycle began mid-October 2011 and was complete by end of November. In reality, bills were arriving well into December. Anyone who does not have power supplied by an electric company in Greece, or anyone who tried disconnecting electricity after September 17, 2011 in an attempt to avoid the tax, will be billed directly by the tax office at whatever address the property owner gave as their last known address. For 2013-2014, this special tax will be combined with the main property tax and billed as a uniform tax. It has already been agreed that five installments will be invoiced via electricity bills. DEH/PPC stopped accepting responsibility for the property tax (EETIDE), which I learned on April 6, 2012. No announcements were made by DEH/PPC, the government or Greek news. Those who already paid the last installment of property tax could let it stand as an overpayment/credit on the next electricity bill or get a refund from the cashier. Those who had not paid the last installment were told to only pay the electricity portion owed. (*Anyone who never knew they had a choice will see a credit on their electricity bill and may owe money to the eforia for the last 2011 installment of the EETIDE). If the bill was not in our name, or jointly connected to someone else, we needed: a) a copy of the lease/rental agreement and a dilosi from the named person (i.e., landlord, previous tenant) to get our money back; or b) to ask the landlord(s)/previous tenant(s) to get the money. The EETIDE should be paid at the tax office/eforia. Finally on May 5, To Vima reported that the ‘xaratsi’ had moved to the tax office, followed by the remainder of news agencies 10 days later. DEH/PPC made an announcement in June and quoted the effective date as April 30, though in reality it started almost a month earlier. Mainstream English-language newspapers spread misinformation that the property tax had been abandoned. It was decided on July 18 that the property tax would continue to be invoiced on electricity bills, with five 2012 installments beginning end of July. On December 4, a court deemed it illegal to assess and collect property tax on electric bills, and the next day DEH confirmed that it is accepting payment of electricity bills minus the tax. However, on December 19 and after several hearings, an Athens court ruled in favor of the Ministry of Finance that DEH continue to bill and collect money through March 2013 and Greece’s creditors agree it should be left ‘as is’ until 2014. Whether your bill is correct depends on the accuracy of property details, zone rates and your official status on file at tax offices as of September 17, 2011, plus harmonization between the tax authority and power company. Errors are not necessarily the fault of the power company or tax office, as property owners/taxpayers, builders and engineers are responsible for any data and updates reported to the state. Anyone who believed the property age/measurement or zone rate was incorrect had to pay the bill by the stated due date, then submit an application to correct errors at local municipality offices by January 20, 2012.
Corrections forwarded to the power company were applied by March 31, 2012 and reflected as a refund in the April 2012 installment. You pay the electricity bill as you normally would. The law as written stated that anyone not paying the property tax would have power cut, but several amendments were made and a high court has since intervened. In a word, waffling. The original DEH/PPC policy says interruption of service can occur in 44 days — 30 days past the original due date of the ‘Ekkatharistiko’ (top right corner) and 14 days to pay after a courtesy ‘final’ diakopi/disconnection notice. If your electricity is disconnected at the 60-day mark, the power company will inform the Ministry of Finance and you will be required to obtain a certificate from tax authorities that you paid the property tax before applying for a new connection anywhere. A several-times revised government circular says you have 80 days 6 months to pay before power is cut, then 20 days to make amends and apply for reconnection of electricity. Delinquencies are reported by DEH at the four-month mark to the Ministry of Finance, which can then give the homeowner another two months to pay before ordering disconnection. c) can prove there is another legitimate hardship. Power cuts on 20,000 of 250,000 households that did not pay the tax by the 80-day deadline or apply for an exemption began January 23, 2012, starting with properties with the highest value per square meter. It was expected that up to 500,000 households would have electricity discontinued due to non-payment and no notification of hardship on file. When harsh winter weather became an issue, the Ministry of Finance halted disconnections. On May 25, the Council of State upheld that the tax was legal, but disconnections were unconstitutional. On March 2, the Council of State ruled that power cuts due to non-payment of property tax are unconstitutional. No one is under threat of losing power for non-payment of the property tax, but disconnection is still possible for those not paying the electric portion of their bills. Anyone having trouble paying the bill can appeal to the tax office/eforia/DOY to reduce the tax or arrange a custom payment schedule, according to a government circular. All outstanding property tax debts will continue to appear on future invoices and be referred to the tax office for further action. Those who did not pay the 2012-2013 installments by June 21 were forwarded to the Ministry of Finance for collection and must clear outstanding debts at a tax office. The Ministry of Finance will garnish wages and pensions and/or seize and auction properties to pay outstanding tax debts. This is legal. This article was provided as a courtesy, which required several hours of my unpaid time to translate, compile, research, write and update from 1500 to 3000 words after several amendments. Please remember that I am a journalist, not a tax accountant, lawyer, inheritance expert, DEH/PPC employee, real estate agent or civil engineer. There is no way for me to learn thousands of complicated and ever-changing tax laws of 190+ countries worldwide, then apply them to your specific situation, citizenship, residency status and property. Readers are free to leave questions, but you should query the appropriate authorities, an accountant or a lawyer. Tax offices: See, “List of DOY/eforia/tax offices in Greece.” The GSIS call center also takes inquiries at + 30 (210) 480-2552. DEH: Power company offices: See, “DEH/PPC Electric company offices in Greece.” Special hotline has been set up at +30 (214) 214-1000. Thanks for this informative article. I wonder if you know what the rules are for when someone lives in an apartment that they neither own nor rent i.e. it belongs to a family member and the person stays there under ‘filoxenia’. Since that person’s name is on the electricity bill, will they still have to pay? As it says in the article, work it out with the owner(s) of the apartment. There are 2 rows τμ on our electricity bill. One labelled ΔΤ the other ΔΦ. Same no of sqm on both rows. Should I count sqmx2 in order to find out how much we need to pay? Thanks in advance! As it says in the article, τμ means square meters; and yes, the figure should be the same all over the bill. I don’t see how I can make the calculation more clear. Clear and concise and very helpful. Thanks. Thank you for saying so. I had doubts based on the first two comments. Excellent article, thanks so much! I can’t find the Zone Rate on my DEH bill. The bill is from June 2009. Do the more recent bills include this information? I have electric bills going back to 1998, and they all list the zone rate. If you’re looking at a three-pane bill (old format), it’s still on the page with the perforated payment coupon. Look in the middle pane under ΤΕΛΟΣ ΑΚΙΝΗΤΗΣ ΠΕΡΙΟΥΣΙΑΣ (ΤΑΠ), the same heading I give in the article. Using the 2009 zone rate can help you estimate taxes, but you need to look at a recent bill with current rates to make an accurate calculation. The euro/m2 entry is the rate you’re being charged for electricity, not the timi zonis. You’re looking under the wrong heading. Good luck. Very well written, informative as all get out (as always). But man do I hate the subject matter. “Athletic clubs” are excluded. Now I get why Mr. Shankat’s cousin opened that storefront team club. Absolutely ridiculous. Damn the man. There are always people looking for loopholes in Greece, especially concerning laws that were written with haste and not much thought. Thus 63 x 3 euros x 1 = 189.00 euros for 2011? I cannot explain the calculation more clearly than I already did. If you followed my example, then yes. I don’t have time to verify people’s figures, as I’m on the road and working. Superb article, as usual. Very clear and very informative. 1) A family with three (or more) children that owns a residence and rents it out, with the DEH bill in the renter’s name. 2) A family with three (not more) children that owns and lives in a residence. Assuming both properties are under the TM and TZ limits and in neither case are the families considered low income, per the proposed law they would each be entitled to the reduced rate for large families as regards the new tax. The question is: How do they declare this? A third and more general scenario also comes to mind, possibly applicable to me in the future regarding the properties if this law is permanent: A vacant residence, with power to the property shut off. Is the property then not taxed? Might this also apply if someone has power, but self-generates or otherwise self-procures it, and thus has no electricity bills from a utility. Thank you in advance, and again, great work! Long story short, I found the answers to my specific scenarios posted on 23 Sep after reading what I believe to be the version of the law that was actually passed, as well as several supporting sources from the MoF. It appears people with 3 children don’t get the reduced rate, unless qualifying separately based on another provision, of course. Separately, people that do qualify for the reduced rate, or an exemption are apparently required to send an SMS text to the MoF. Even if we disregard the irony of requiring the blind, disabled, low-income, etc. to send an SMS, they only have until 2 Oct to meet the first deadline or will presumably be billed for the first installment at regular rates to be adjusted later if they find a way to get through to the MoF by 30 Nov! If someone wrote all this stuff out in a novel, it would never sell — way too unbelievable to anyone not resident in Greece, and way too familiar to those who are. PS Good luck sorting out this law and the “implementing instructions” that have already started and will surely flow steadily from the government, some contradicting another no doubt! I just spent an extremely frustrating morning at DEH where I was told that families with 3 kids only qualify if the family income is under the ‘base; for triteknoi families. Firstly, I have no idea what this means & secondly, I don’t think I have found any reference to this anywhere (I may, of course, have missed it). Does anyone know anything about this? Thanks, I feel a bit daft, since I found the answer n Kathimerini, truns out that it is only for large families that earn less than 30,000 a year. Thanks for the fantastic work by the way, you are a godsend. As mentioned in Tavros comment above, that’s true. Families with four children only qualify for the low rate if under a certain income level, not those with three children. I cannot cover this question in a comment as it would require an entire post unrelated to the property tax itself and I don’t have time at the moment. There have been amendments since Kathimerini published its article and my last update. I’ll get to it as soon as I can. Many thanks for this informative article. It finally made sense of all the rumours. I’m a little confused as here in Crete many of us only have work in the season and collect money from OAED in the winter months….how will this affect our tax liability? Your question does not pertain to the property tax article above, and I do not dispense advice on Greek tax laws for reasons given in “2011 Tax deadlines for Greece.” If I were a tax accountant and not a journalist, the little information you provided is insufficient to give an informed answer and tax laws are still being overhauled. Hi there – I have a house near Stoupa in the Mani and I really appreciate your article helping me to understand the potential cost. One question about the zone rate. It is written 58,00 on my bill, which I would love to be 58, as it would give a much lower charge. However, I fear it means really 5800, which would be more than 5 times higher than 58. Please can you confirm how to read this figure correctly? 58,00 is 58.00, not 5800. All best. I am a little different , I have a holiday unit in Athens and live in Monaco. I rent it out as a holiday apartment and the electricity bill is in another persons name who I think is on unemployment benefits. Should I change the electricity bill into my name ? As I cant find the other person who currently uses the address to collect money from the government. I think she is currently holidaying in Australia. As I say in the article, it does not matter whose name is on the electricity bill. It just needs to be paid. Thank you I now understand so much more!! Query re defining ‘electricity supply area’. Thanks for a very clear and helpful article. We found the sq metres and zone on DEH bills easily. For us this seems a fair tax at a time when Greece needs the money, but maybe a large amount for some to find in a hurry. Dimarkeio costs plus this tax are still far less than UK council taxes. I’m not sure our 90m2 are correct though, re your comment that size is ‘area inc. …storage areas, balconies etc’. Our basement is probably not included – it has a light and is used for storage, but is very low ceilinged in most parts with bedrock minimising height, floor size & usable space. Do you know if it is inside room measurements, or outside building size? Is there a minimum height? Also does a light on a balcony or in a storage area constitute an electricity supply, or do they mean with plug points? Our balcony light is on a cable through the wall which is plugged into a socket in the bedroom! If lighting is considered an electricity supply, what about garden lights? Will the declared sizes be checked? or do we have to fill in a form at some stage? We moved here about 3 years ago when the electrician presumably had to confirm sizes to get the power reinstated and in our name. Hope you can clarify or let me know where I could get answers.